Dental bridges in the past were the best dentistry could do to replace missing teeth. 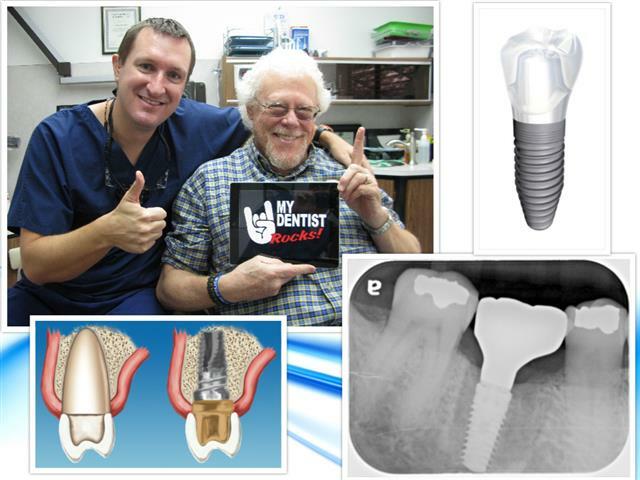 Modern dentistry now has dental implants. 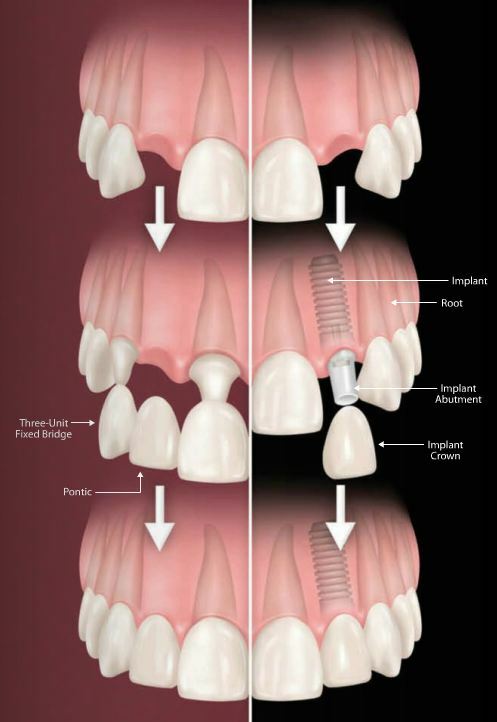 Dental implants are the best and longest way to replace missing teeth. 1. Have to grind down healthy teeth to support the bridge. 2. The bridge takes a one tooth problem and spreads the problem to adjacent teeth. 3. Due to aggressive cutting of the healthy teeth, many anchor teeth will require root canals. 4. 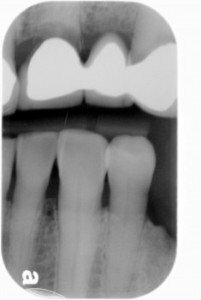 Root canal teeth can have failures that necessitate their removal. Now patients have greater dental problems then the original missing tooth. 5. Bridges fuses the teeth together making cleaning and flossing very difficult. 6. Because of the difficulty of cleaning bridges, many anchor teeth get decay. The bridge has to be cut off, decay removed and a new bridge made at the patient’s expense. Worse, the decayed tooth cannot be saved and the patient has a serious dental problem. The above X-rays were taken today and the inspiration for this blog article. Patient had a bridge. The anchor tooth on the bridge has massive decay (decay outlined in red). The patient will lose the bridge and the anchor tooth due to decay. Now the patient has a huge dental problem that could have been avoided by using a dental implant. Dr. Nugent has had to replace teeth on his father, father-in-law, mother-in-law, friends, staff members and a staff member’s daughter. 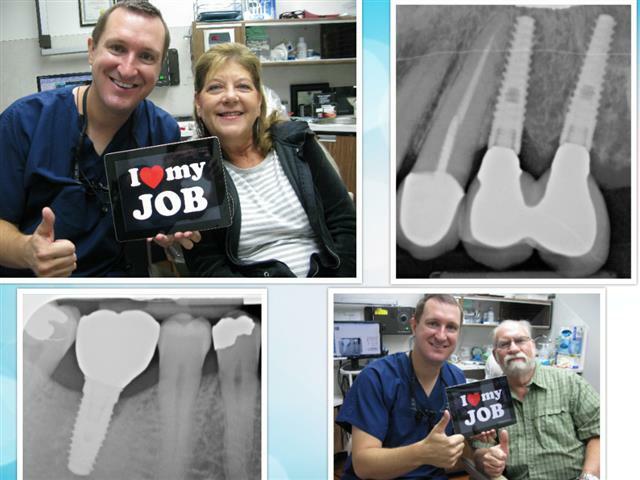 Dr. Nugent utilized dental implants to replace his family and friends missing teeth. Dental implants do not damage adjacent teeth. 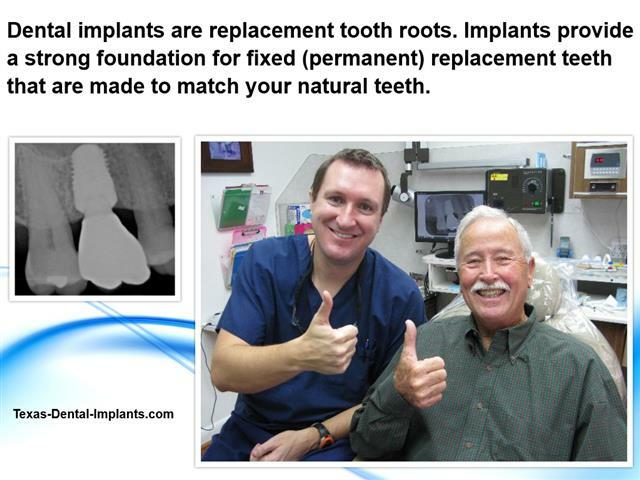 Dental implants will never decay or need root canals. Patients brush and floss their dental implants just like their normal teeth. Dr. Nugent is a leader in dental implant therapy. His dedicates a large amount of time in his Pasadena, Texas Cosmetic Dentistry practice to dental implants. Dr. Nugent has helped patients in Pasadena, Deer Park, La Porte, Friendswood, League City, Webster, Clear Lake, and Houston Texas. Demand the best in dental implant care! Dr. Nugent was voted BEST PASADENA TX DENTIST 2010 and BEST PASADENA TX DENTIST 2011. Come see why Dr. Nugent is “The Pasadena Texas Dentist”.